As the days get longer and warmer the blooms of algae will start to get larger. Specifically, noctiluca is what we are looking for. As the biomass increases in June, we will start to see the magical emittance of light from noctiluca. The light is known as bioluminescence, the emission of light by living organisms. This is a fascinating display that can be observed at the surface of the water from the kayak. While we paddle along the surface we disturb the mass of noctiluca and it is the disturbance that creates the response. It is not completely understood why these microorganisms create light when disturbed. One theory is that the quick burst of light confuses potential predators just enough to avoid being eaten. Discovery Sea Kayaks lead guide, Jason Gunter was completely fascinated with the phenomena and wanted to start sharing this experience with visitors to San Juan Island. 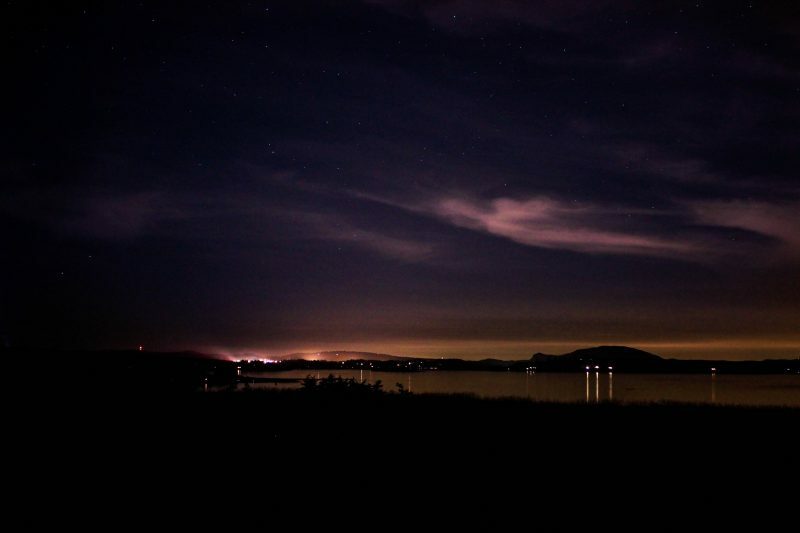 So Discovery Sea Kayaks took the first bold step and became the first kayak tour operator on San Juan Island to offer a Bioluminescence Kayak Tour. In the early days, the kayak tour was not getting much attention. But little by little word of mouth began to spread about how amazing the kayak tour was. Discovery Sea Kayaks was fortunate enough to host a couple of different writers that published really nice articles about the tour. This really got the word out and finally, after a few years of dedication, we started seeing lots of interest in the Bioluminescence Kayak Tour. Now fast forward some years later there are other outfitters trying to follow in our footsteps. Taking the language from our website and replicating our calendar every season now. But we are flattered and excited we were the pioneering San Juan Island kayak tour outfitter that brought something so special to the islands that others felt the need to copy us. Though other outfitters on San Juan Island are offering the tour, no one has as much experience as Discovery Sea Kayaks operating kayak tours. Today we offer Bioluminescence Kayak Tours during the months of June, July, August, and September. You can visit the Bioluminescence Kayak Tour page on our website for dates and make reservations online. Space is limited and we only run one kayak tour per night to keep the evening ambiance calm and magical. If you are planning a vacation to San Juan Island and looking for a unique and unforgettable experience. Contact Discovery Sea Kayaks and reserve the original Bioluminescence Kayak Tour on San Juan Island.